The Bouncer is a Dunmer bandit guarding Cragslane Cavern. Upon seeing you, he will draw his weapon and warn you away, saying, "These fights are invite only. And you're not invited. Slag off." He will attack if you approach too closely. 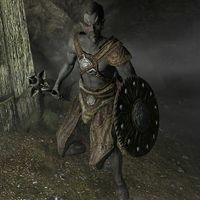 Before version 1.9 of the Official Skyrim patch the bouncer was simply named 'Bandit'. In Patch 1.9, he displays no name and cannot be looted.